It was always sweet when mom used to say stuff like, "Sleep tight, don't let the bed bugs bite." Like you really had a choice in the matter. Nobody in the history of beds or bugs has ever actually wanted those pesky little bloodsuckers chawing away on their skin all night. But, inevitably, it can happen. In case you aren't an aspiring Gil Grissom, bed bugs are the common name for Cimex lectularius, a flat, louse-like insect that lives off the blood of other animals. Because they're so dark, they can be hard to spot, especially when hiding under furniture or in dark corners of your hotel room or hostel bunk. And while they don't transmit any diseases, they can leave nasty, itchy bites that are at best highly uncomfortable, and at worst leave you boiling all your clothes as soon as you get home. Even nice hotels can catch a case of bed bugs, so it can pay to turn on your cellphone flashlight and have a look around as soon as you get to your room. We talked to some folks at Rentokil, who kill bugs for a living, and they told us where to look to find the critters before they find you. So, what should you scan for in your room? Saying, "I'm looking for bed bugs" is all well and good, but do you even know what you're looking for? 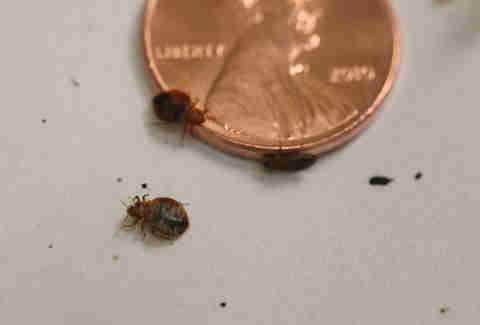 Small, crawling insects roughly the size of apple seeds are the dead giveaway, but sometimes you can have bed bugs without actually seeing them. Juvenile bed bugs shed their outer skins five or six times, so look for what might be discarded insect skin in the areas we outline below. Also, small blood smears don't mean somebody went all Very Bad Things in your room right before you got there. 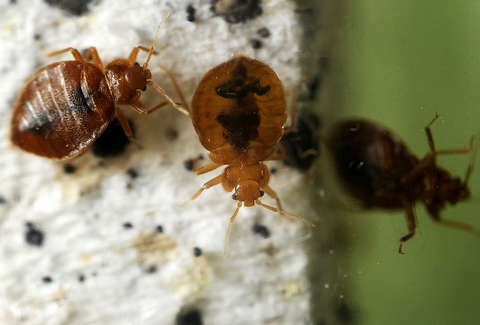 It could mean bed bugs' messy eating. You can also look for tiny black smudges that denote bed bug excretion (kinda like insect skid marks) or tiny white eggs, generally about 1mm in length. Once you finish scanning the bed, you’ll want to check other areas of your room. Here's what to look at, and where in your room to search. The mattress and bed frame. The most obvious spot to look for bed bugs is in the mattress, but spotting them is a little more involved than just picking the mattress up and looking for dark spots. 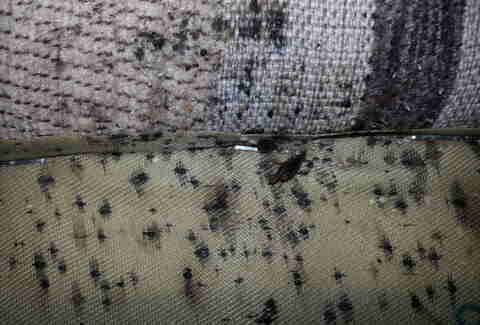 Bed bugs tend to hide in the joints of the frame and along the slats. So inspect those with a flashlight first. Then look in the crevices of the headboard, in the intricate details and design, then along the mattress seams and in the zipper. If all is clear there, pick up the mattress and look under it, which was probably the only move you'd thought of until now. Sofas and throw pillows. "Plush pieces of furniture bugs" is too unwieldy a name, but these creeps range far beyond mattresses and headboards. Quite often, you'll find them in other soft seats but NOT in the bed. Take a look along the seams, inside the slip cover, and along the zippers of any decorative pillow or sofa cushion. Closets and floorboards. Bed bugs don't even need soft, cushy spaces to find a home. They can be hiding in your closet, which can ultimately lead to that unfortunate clothes-boiling we mentioned earlier to try and get them killed. Check the spots where floor boards or floor molding meet the wall. These little corners are popular hangouts for bed bugs. In the closets, take a look at the seals of the doors and drawers, as well as the joints and corners of the closet. Basically, anywhere you might find a spider web, you might also find bed bugs. Night stands. Much like with the rest of the furniture, look at the drawer seals and corners of the nightstand. Also check inside lampshades or the spots where the lamp makes contact with the nightstand. Same goes for picture frames, alarm clocks, or any other bedside decor. Luggage and luggage stands. If you want a cheap souvenir from your hotel, go ahead and grab that notepad off the desk. What you don't want is a souvenir family of bed bugs. Take a look at the webbing on the fold-out luggage stand, especially where it wraps around the frame. And just to be safe, never, EVER put your luggage on the bed itself. Those bugs will jump right in and might never leave. Matt Meltzer is a contributing writer for Thrillist who had to boil his luggage last year after an unfortunate hotel stay. Follow him on Instagram @meltrez1.